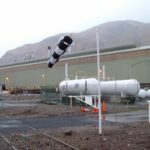 Klingair Limited manufactures a range of windsock masts to suit most applications whether they be ground-based, fixed or pivoting-based, or building mounted models. We have a large range of standard products but we welcome the opportunity to manufacture masts and swivel assemblies for bespoke applications. We specialise in the manufacture of stainless steel and galvanised products for industrial and marine applications. Advice is available on installations. Supply and install quotations can be provided for difficult installations.